Russia's Progress M-28M cargo ship blasts off from the launch pad at the Russian-leased Baikonur cosmodrome in Kazakhstan on July 3, 2015. MOSCOW - Russia on Saturday launched an unmanned Progress space freighter carrying supplies to the International Space Station from the Baikonur cosmodrome in Kazakhstan. 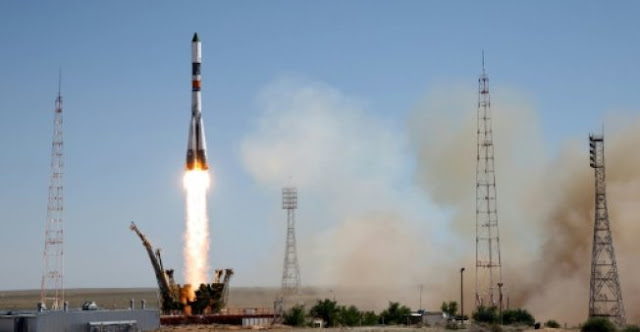 The Soyuz 2.1a rocket carrying the ship successfully reached orbit eight minutes after taking off at 11:47am Moscow time (0846 GMT), a Russian space agency commentator said in the live feed from mission control. The event was pushed back by two days from October 12 after an automatic shutoff of the launch one minute before liftoff, with a commission still figuring out the reasons. The Progress MS-07 is carrying over two tonnes of various cargo including fuel, station supplies and personal items for the international crew of six currently in orbit. The cargo ship is expected to reach the space station on October 16 at 1109 GMT and will be automatically docked. Cargo ships are later filled with trash before they are undocked and burn up in the atmosphere as they orbit back to Earth. Russia on Saturday launched an unmanned Progress space freighter carrying supplies to the International Space Station from the Baikonur cosmodrome in Kazakhstan.